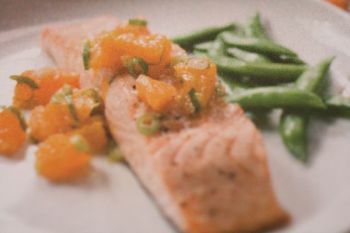 This salmon, with its puckery, citrusy jolt, may not be the most appropriate dish for a late-winter meal. 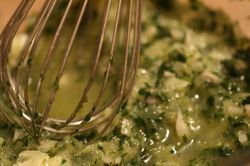 The grapefruit-and-basil relish might seem more at home adorning a fish straight off the grill on a warm summer night (and that would be delicious). But you shouldn't wait for summer to try this clean, refreshing twist on oven-roasted salmon. The relish is extremely tasty, and it's a snap to make. We used white grapefruit instead of red. And, judging by the Cook's photo below, we cut our grapefruit much smaller than intended. So maybe our relish was more of a coulis. So sue us. Seriously, though, it's delicious, and would be a great topping for other kinds of fish, too. 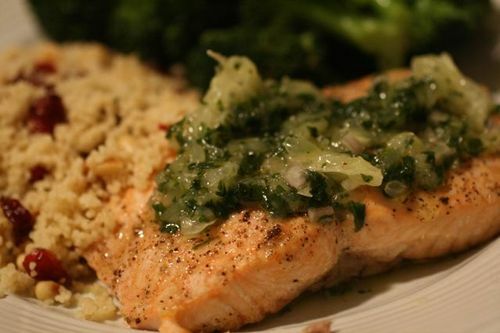 One other big benefit of this recipe: We roast salmon in the oven all the time. It's pretty hard to mess up, as salmon is an awfully forgiving fish. But this recipe's technique of initially heating the oven to 500 degrees and then turning it down to 275 when you put in the fish is a great idea. We'll definitely use that technique from now on. The salmon turned out flaky and somewhat caramelized on the surface, while deliciously moist and perfectly cooked inside. To ensure uniform pieces of fish that cook at the same rate, buy a whole center-cut fillet and cut it into 4 pieces. If your knife is not sharp enough to easily cut through the skin, try a serrated knife. 1. Adjust oven rack to lowest position, place rimmed baking sheet on rack, and heat oven to 500 degrees. Use sharp knife to remove any whitish at from belly of fillet and cut into 4 equal pieces. Makes 4 or 5 shallow slashes about an inch apart along skin side of each piece, being careful not to cut into flesh. 2. Pat salmon dry with paper towels,. Rub fillets evenly with oil and season liberally with salt and pepper. Reduce oven temperate to 275 degrees and remove baking sheet. Carefully place salmon skin-side down on baking sheet. Roast until centers of thickest part of fillets are still translucent when cut into with paring knife or instant-read thermometer inserted in thickest part of fillets registers 125 degrees, 9 to 13 minutes. Transfer fillets to individual plates or platter. Top with relish and serve. 1. Place grapefruit in fine-mesh strainer set over medium bowl and drain for 15 minutes. 2. Pour off all but 1 tablespoon grapefruit juice from bowl; whisk in shallot, basil, lemon juice and oil. Stir in grapefruit and season to taste with salt and pepper.